This entry was posted in AFRICAN ARMED FORCES, ARMED CONFLICT, BOKO HARAM ISLAMIC STATE MOVEMENT, COUNTERINSURGENCY OPERATIONS, DEFENCE INDUSTRIES & PRODUCTION, GLOBAL DEFENCE NEWS, JOINT SECURITY TASK FORCE, JOINT(MILITARY)TASK FORCE IN THE NIGER DELTA, MILITARY HARDWARE, MILITARY PHOTOS, NIGER DELTA CONFLICT, NIGERIAN ARMED FORCES, NIGERIAN ARMY, NIGERIAN SPECIAL FORCES, PEACE SUPPORT OPERATIONS, RELIGIOUS FUNDAMENTALISM, RISK ANALYSIS, SECURITY ISSUES AND CONCERNS, SPECIAL TASK FORCE, TERRORISM, URBAN GUERRILLA WARFARE, WEST AFRICAN STANDBY FORCE and tagged Boko Haram, COUNTERINSURGENCY OPERATIONS, DEFENCE AND SECURITY, GEOPOLITICS & STRATEGIC STUDIES, JOINT SECURITY TASK FORCE - OPERATION RESTORE ORDER, JOINT TASK FORCE - OPERATION PULO SHIELD, NIGERIAN AIR FORCE, NIGERIAN ARMED FORCES, NIGERIAN ARMY, NIGERIAN MILITARY HISTORY, NIGERIAN NAVY, OTOKAR COBRA APC, SPECIAL TASK FORCE - OPERATION SAFE HAVEN, TERRORISM. Bookmark the permalink. How many of the 204 Cobrals are being operationally deployed for COIN operations at the moment? Or are they just being packed inside the garages of the Military formations? Anyway, I learnt they are merely refurbished APCs bought from Otokar Turkey. But how valid is that assertion Mr Beegeagle? I am certain this were new. I beleiev they were delivered in two batches between 2003 which inevitably means that some look much newer than others. I remember reading an eye witness account of a delivery of this vehicles directly to Nigerian UN forces in Liberia, and there was little doubt that this were new. This is the amphibious version of the OTOKAR Cobra therefore it got some alterations to the body to be seaworty and, in addition, a pair of hydraulic thrusters. ALL units of Otokar Cobra APCs were delivered BRAND SPANKING NEW. Order placed Jan/Feb 2007, delivery of initial 55 units were made in 2007 and in 2008, 149 units followed. All the Panhard VBL and Fox scout cars were brand-new as well. Ditto all 300 units of Steyr 4K-74A G127 APCs which came as knocked down parts and were assembled at the Special Vehicle Plant in Bauchi..as were the Pinzgauer utitily vehicles. Don’t mind our people and their limitless capacity to self-denigrate even when they do not know what they are talking about. 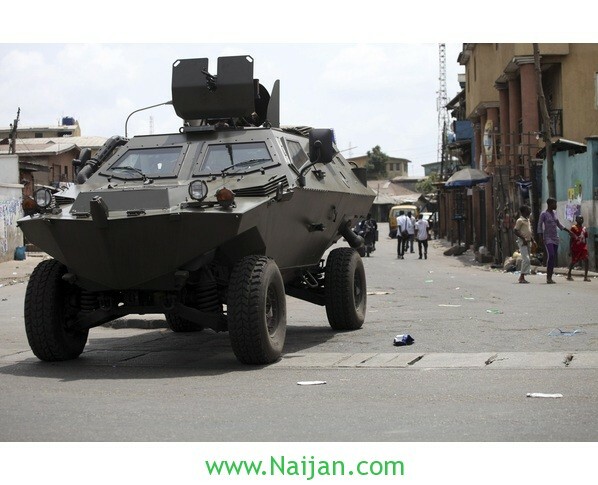 Remember that El Rufai, voluble as he was in his last critique, referred to Otokar Cobra APCs as Chinese-made APCs. That is the way we are. The ONLY APCs which came into NA service from surplus stocks albeit UPGRADED before delivery, were the 67 units of MT-LB armoured combat support vehicles and 18 units of BTR-70 APCs which came through Poland and Ukraine. Then we got an additional 70 units of MOWAG Piranha APCs through Canada in support of Darfur operations. Like my commander Eyimola just pointed out, the first Cobra APCs were delivered direct to Liberia as the ship made its way to Nigeria. I published that story on a Forum where we both belong. The delivery was witnessed by expatriate humanitarian agency workers in Monrovia. At that time, the NA similarly had an order for 400 Landrovers and some of those were also dropped off in Liberia. I have posted photos of Otokar Cobras from the four corners of Nigeria. They are deployed alongside Panhard VBLs across all conflict zones – Greater Borno, Kano, Kaduna, Jos, the Niger Delta etc and they are so liberally deployed that a relative who is based in Maiduguri where he is a lecturer actually suggested to me that there have to be 2,000 units of Panhard VBLs and Otokar Cobra in Maiduguri alone. I nearly choked on my drink. Mural of the story though is that they are very heavily deployed. Take some time to look through our archives. We have photos of Panhard VBLs and Otokar Cobras deployed operationally in Bauchi, Kano, Jos and elsewhere. Personally, during the course of several trips to the North during the months of March, April and May, I was on ground to see the passing out parade of a batch of the Quick Response Group at Jaji. Between CTCIC where I stood beside Otokar Cobra APCs (no 12C and 16C) painted in olive colour, I also saw about five Otokar APCs at the NAPKC nearby which were painted white. It is clear that peacekeeping troops in Liberia and Darfur and CT-COIN troops in the conflict zones are also training on this vehicle type which is the mainstay armoured vehicle for their operations. Use the search window on the blog to search for “Otokar Cobra APC”. I am sure you shall see them deployed in Kano, Lagos, Jos, Kaduna, Bauchi, Darfur and Liberia. @ Beegeagle, the Cobra in the pic was the one I was refering to weeks ago. Apparently, the NA bought 2 different versions of the Otokar Cobra. iraq ordered 500 MT-LB APCs from bulgaria for 96 million usd. Naija seems to be cool with 67 of the same. The same iraqis have ordered 600 otokar cobras, vs naija’s 204. Futhermore, the US gifted them 8000 up armored humvees. They got 500 T-72s from poland, and several hundred BMP-2s. They have ordered 40 plus F-16 C/D variants, 140 M1A2 abrams MBTs and several helicopters. Aren’t we(nigeria) facing the SAME challenges as Iraq ??? While we are debating whether our vickers tanks are fully refurbished and not out dated, morocco has requested 200 refurbished M1A1 abrams MBT from the US. The package includes associated ammo & training. In addition to their FREMM destroyers from france and advanced F-16 variants from the US. Iraq is an oil rich country, with comparable sectarian issues with nigeria. Morocco, is yet another african rival that now outclasses the nigerian armed forces. Yeah Beeg, I wonder when nigeria bought and delivered these 400 land rovers that you mentioned. I recall that the UK made it known, that they sent an unknown number of Jeeps to freetown in the midst of the 1999 battle for freetown. This was done to alleviate mobility problems ecomog troops where having in freetown. Which made it difficult to counter the rebel infiltration. If NA had received 400 land rovers at anytime prior to 1999, why was the UK jeeps necessary ?? My God Doxie, to think that Nigeria has the same problem as Iraq! Morocco doesn’t even produce petroleum. I wonder how our strategist/procurement officers think! This “piece meal” approach to procurement will not do our troops at the frontline any good at all, it only increase attrition and waste lives. MOD,please get this hardware in their numbers, save the lives of our gallant soldiers, save the lives of innocent Nigerians.